Spend some time under the water at Julian Rocks Marine Reserve, which is now part of the Cape Byron Marine Park. The marine life is varied and abundant, because tropical and temperate currents mix in the waters in the Bay. You do not have to be a certified diver to experience the underwater world in Byron Bay. Go for a snorkel and see the turtles, rays and fish from a different perspective. For the more adventurous visitors: try an introductory dive. 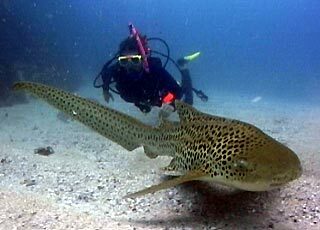 After spending some time in the pool, your instructor will take you for an ocean dive to experience Julian Rocks to the max! Diving is part of our life … our extensive diving section has much more info, photo and video galleries and you can select from our dive accommodation packages or we can custom make one to suit your needs. During the months May, June and July the majestic Humpback Whales pass Byron Bay up close on their journey to their calving and breeding grounds further north. During September and October they come past Byron Bay again when they migrate back to the Antarctic. 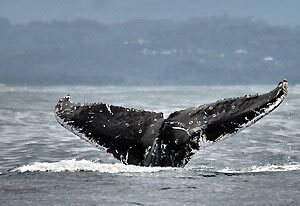 For a close-up spectacle book a whale watching trip and cruise the Bay. Take advantage of our booking discounts when this activity is booked through PLANULA. Get up close and personal with the local dolphins. We have several pods of bottlenose dolphins in the Bay and in a kayak you can experience them without harrassing these special mammals, and have loads of fun and be active at the same time. 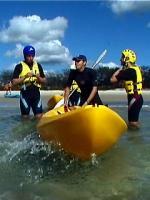 Book your dolphin kayak adventure though us for your PLANULA discount. Never been up on a board, but always dreamt to give it a go? You are never to old to try yourself in this very Australian past time. Byron Bay offers some of the best and most diverse surfing in Australia and there are a number of well qualified surf schools to chose from. From beginners group lessons to individual teachings by some of the worlds best surfers, we can sort you out to “hang ten” for the first time – and of course PLANULArians save on that as well. Come and try microlight flying, one of the greatest adventure experiences you will ever have. 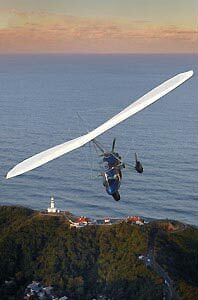 Microlight flying, is the fastest growing recreational sport in the world. It is also very safe, hugely exciting and incredibly spectacular. Based at Tyagarah Aerodrome near Byron Bay is a recently established microlight flying school offering a menu of introductory air experience flights (trial flights) to suit every budget and also provide full microlight pilot training courses leading to the Microlight Pilot’s Licence for recreational purpose. Check out our Microlight accommodation packages. Various wildlife tours covers the coastline to the south of Byron Bay, through the hills, orchards to old growth forests, open woodlands and grassy plains as well as coastal heath. 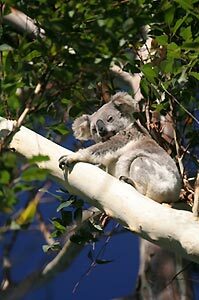 See koalas, kangaroos, wallabies, flying foxes, birds and reptiles in their natural habitat. Or explore the Australian rainforest at night using military grade night vision goggles to observe animals during a Night Vision Walk. Go for a guided walk through the rainforest to see the amazing Minyon Falls or observe over 50 species of bird in different habitats with local wildlife expert Gary Opit. Mountain Biking Adventures run every day from Byron Bay. Feel the freedom and experience the exhilaration as you fly down the spectacular trails in the lush, subtropical rainforests. Our guests receive a discount when this activity is booked through PLANULA. There are too many other activities to mention – but they include horse riding, sky diving, hang gliding, river kayaking, hot air ballooning and swimming.